"I believe that the human race is better off pursuing a future that involves space. While many of the reasons cited for doing so are overblown or in some cases just wrong, the positive reasons, combined with our innate need to expand our horizons and look beyond the next hill come together to make a compelling case for expansion beyond Earth." Tom Hill grew up in Pennsylvania. He attended Penn State University under an Air Force Reserve Officer Training Corps (AFROTC) scholarship and graduated in 1990 with a degree in Aerospace Engineering. The night before graduation he received a commission in the Air Force as a second lieutenant. While waiting to enter active military service, he worked at Edwards Air Force Base as a civil servant, doing early research and development on advanced materials and their application to rocket propulsion. Called to active duty in May of 1991, he entered Undergraduate Space and Missile Training (then called Undergraduate Space Training) to enter Air Force Space Command. After completing training, he reported to Schreiver Air Force Base (then called Falcon AFB) for duty with the First Space Operations Squadron. As an orbital analyst, he carried out early orbit and station keeping maneuver planning as well as orbital refinement for the Global Positioning System (GPS) and the Defense Support Program (DSP), along with some work on the Defense Meteorological Satellite Program (DMSP). It was during this assignment that he met his future wife, Deborah Scott. His next assignment took him to Turkey, where Space Command operated a small tracking station named Pirinclik, which was closed in 1997. The station was founded in the 50s to monitor Soviet missile tests, but in the mid 90s the primary duty of the 75 Americans there was to provide orbital tracking data for Cheyenne Mountain in Colorado Springs. Tom served as a crew commander and chief of training during this tour. After Turkey, he met up with his fiancé for an assignment at Vandenberg AFB in California. As a launch crew commander and operations support flight commander, Tom served in every operational position within the squadron structure: launch crew commander, launch director, mission planner, trainer, and evaluator and was the launch crew commander for the Titan II launch of the NOAA-K spacecraft on May 13 1998. He also served as deputy launch director for a Titan IVB launch from Vandenberg on May 22nd 1999. In late 1999, Tom left active duty for the Air Force, though he still serves as a lieutenant colonel in the Air Force Reserve. He and his wife moved to suburban Maryland, where he works for The Aerospace Corporation as a senior project engineer. In his first position as a civilian, working with the Geostationary Operational Environmental Satellite (GOES), he served as the simulation leader for the GOES-M mission, planning training scenarios for the control crews to hone their skills. He also worked with the next generation GOES spacecraft, developing operations and contingency procedures for GOES N and testing them against the spacecraft. Once the satellite launched in May of 2006, he served as a test director during the operational checkout. Starting in November 2006, Tom took a position within the flight operations segment on the Landsat program. In this position, he oversees technical operations of both the Landsat 5 and Landsat 7 spacecraft, with an eye to keeping them in operation while future missions come on line to continue their mission of monitoring the changing surface of the Earth. Outside of his paid career, Tom maintains an interest in all things related to space, especially human spaceflight. He is an active member of The Mars Society, having led the Analog Rover Project, and founded The Kepler Prize for Mars Mission Design within the organization. 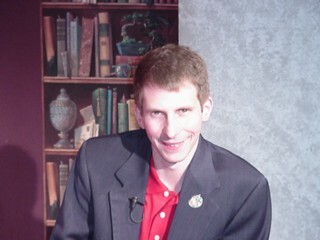 He has authored several papers for presentation there, as well as articles for the American Institute of Aeronautics and Astronautics Journal of Spacecraft and Rockets and Space Operations Online Magazine, The Space Review, High Frontier (the Air Force journal for space professionals), and Space Times (the Magazine of the American Astronautical Society). As the Mars Society's project manager for the Tethered Experiment for Mars inter-Planetary Operations (TEMPO) mission, Tom leads project development, public affairs, and fund raising efforts. In this effort, he became an amateur radio operator with the callsign KB3RXN. An avid public speaker, Tom volunteers to present space-related topics to colleagues, civil organizations, and children of all ages. He also has served as a Discovery Station volunteer at The National Air and Space Museum, discussing topics ranging from ancient astronomy through telescopes, Mars rovers, and meteorites with visitors to one of the most popular museums in the world. He currently serves as a JPL Solar System Ambassador. Space: What Now? Is his first published book. He followed it with an illustrated children's book entitled I Want to go to Mars. Deborah and Tom Hill were married in March of 1997. They have two children: Scotty and Elizabeth. As I wrote Space: What Now? the inherent limitations of a book came to light rather quickly. I wrote the book through the summer of 2003 through February 2004, arguably some of the most turbulent times in human spaceflight. After turning the manuscript in, my already-planned website took on new importance as I realized how much was likely to change over the course of 2004. This blog and informational site is the result. I hope you find something of use here. Although I work in the aerospace industry, serve in the United States Air Force Reserve, and volunteer at the National Air and Space Museum, the opinions expressed on this site and within the book are mine alone and do not reflect the policies of The Aerospace Corporation, the United States Air Force, NASA, NOAA, USGS, or the Smithsonian Institution. 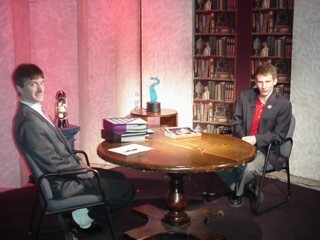 Here is a picture of Tom Hill on the set of the Telly Award-Winning Fairfax County Public Access TV show called "Around Space." The show is produced by the DC NSS/L5 Society Chapter.